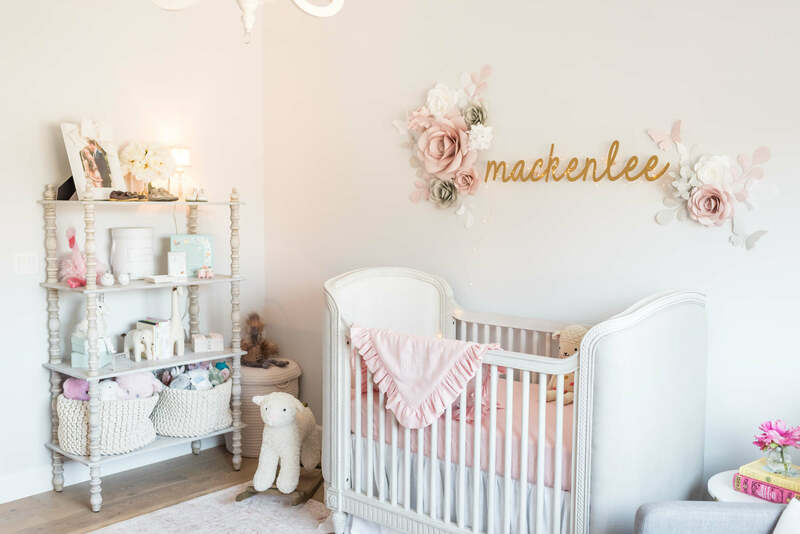 I’m so excited to finally share MacKenlee’s nursery. You may have already seen a lot of these photos on People Babies in their adorable article yesterday. 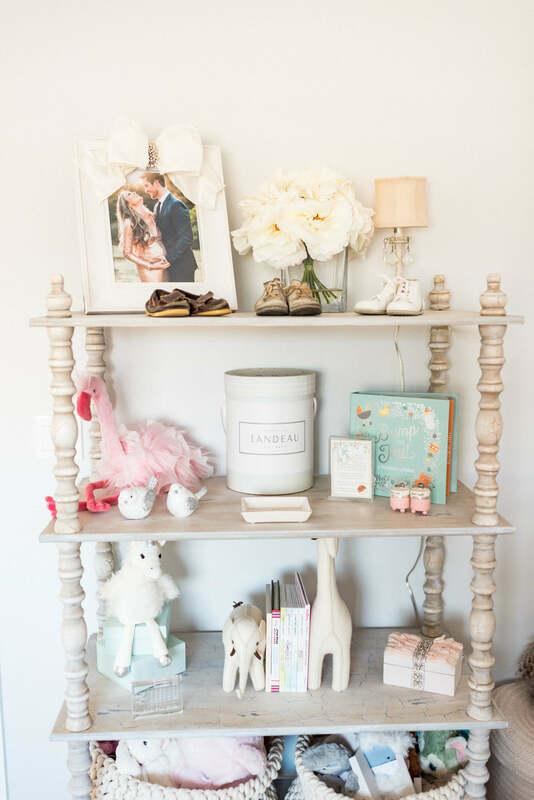 Here’s a little about her sweet nursery… I took my time finding the perfect pieces to make sure it was exactly what I wanted. 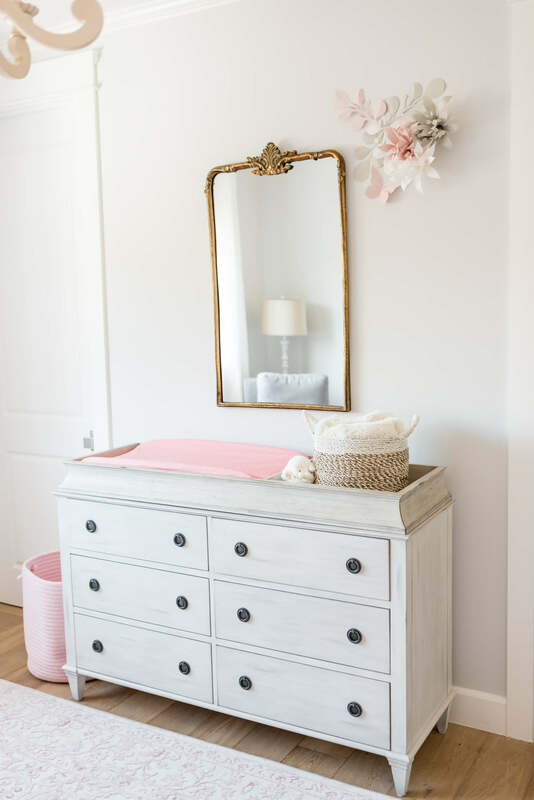 I knew the nursery needed to be a soft pink/blush with a mix of neutrals, so my first purchase was her crib and matching dresser/changing table. 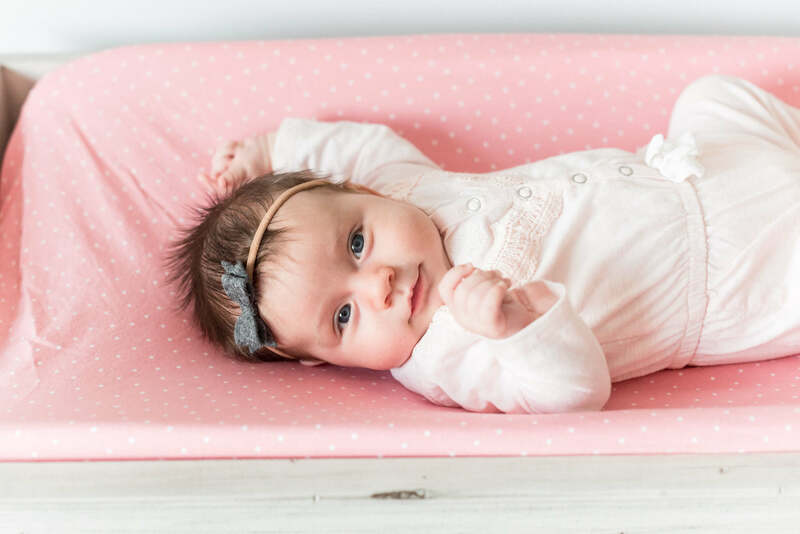 Her crib is convertible and will grow with her into a toddler bed. The changing table topper is removable, so it will be just a dresser once she no longer needs diaper changes. Next was a glider. We knew we’d spend many, many hours rocking baby girl, so we wanted a comfortable place to sit. Our glider and rocking ottoman is already well loved. We use it every night as part of her bedtime routine and I use it throughout the day when I nurse MacKenlee. 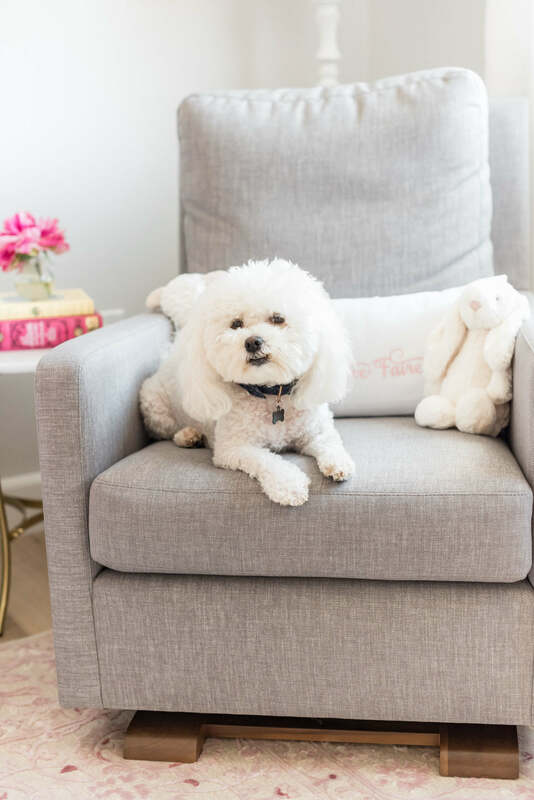 I teamed up with the incredibly sweet Tori from New Arrivals, Inc. to create the perfect linens. I had my heart set on a white linen crib skirt that was flowy and laid beautifully on the floor… Tori designed the perfect skirt! She made matching white linen curtains with a pink ribbon detail. 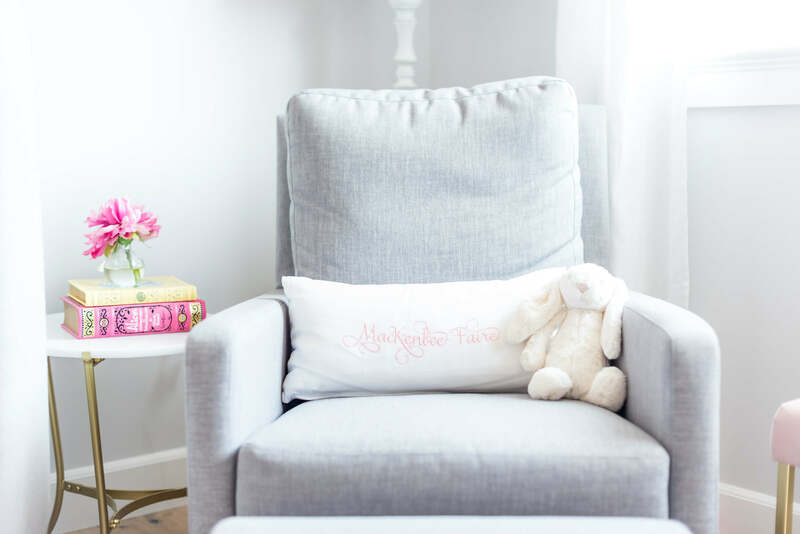 The crib blanket and throw pillow were monogrammed in matching shades and add such a special touch to her room. A big thank you to Tori for all her help in creating this precious space in our home. 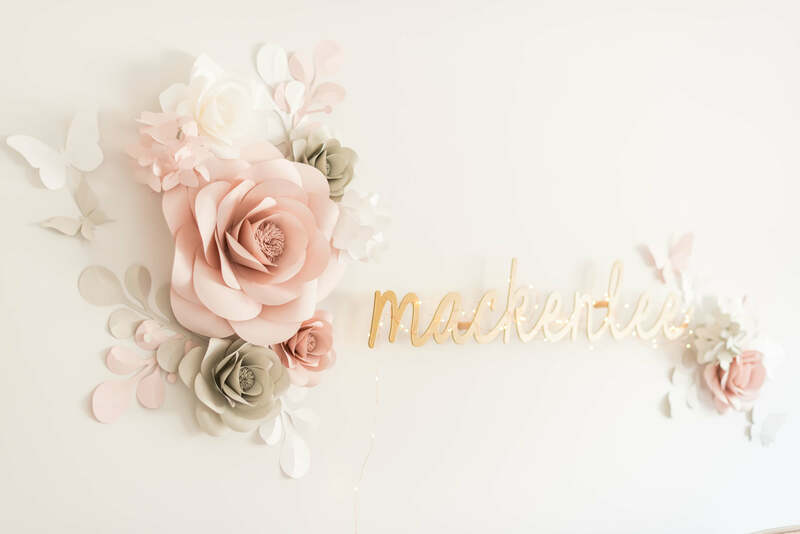 Side note: How stinking cool is it that baby girl has a bedding set and paper flower set named after her?! I went back and forth and back and forth over the walls. I really wanted wallpaper, but in the end decided that a neutral paint would be best. We chose Dunn Edwards paint in “Laced Veil” and it’s perfect. We’ve had several friends ask for the name so they can use this paint color in their own homes. It’s a beautiful grey paint that isn’t too yellow or too blue, which is so hard to find. 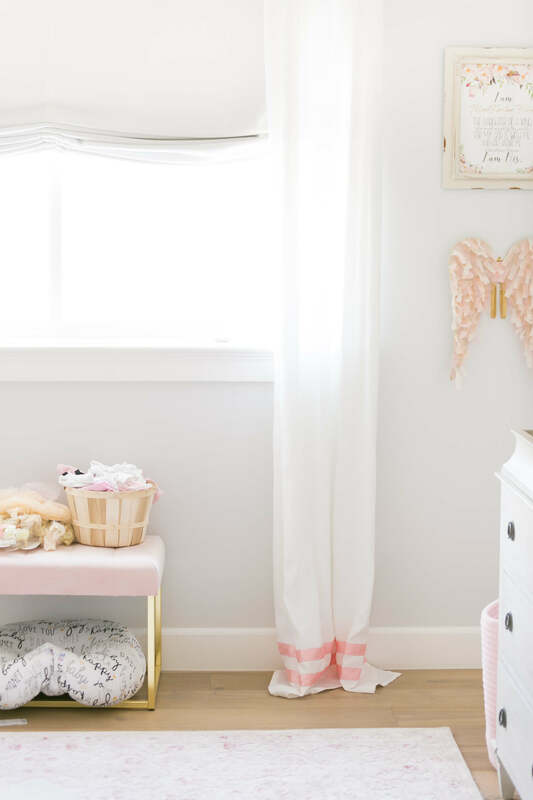 Here’s a list of everything in the nursery. If I’ve missed anything, please comment below to let me know. Books: Alice in Wonderland (gift from Urban Decay), Anne of Green Gables (gift from a sweet reader), Bump for Joy! Its absolutely beautiful! I love the color scheme. If I had a girl, it’s what I would have done. It’s so soft and soothing. Love it ? 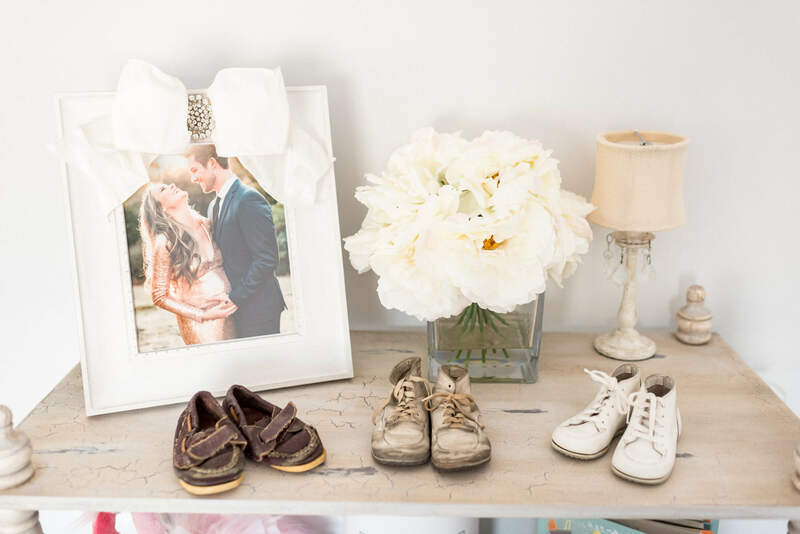 Such a cute room and I absolutely LOVE the old baby shoes! I love her nursery! It’s so beautiful. We did our daughter’s nursery in gray and light pink and I just love how calm and soothing it is. I’m currently doing her playroom in the same colors but adding in touches of gold and I love the name above the crib. I might need one of those for our playroom, so sweet. Wow! Her room is so welcoming, soft, calming and sweet!! 🙂 I even want to sit in there just to feel more peaceful:D Thanks for sharing, Angela! 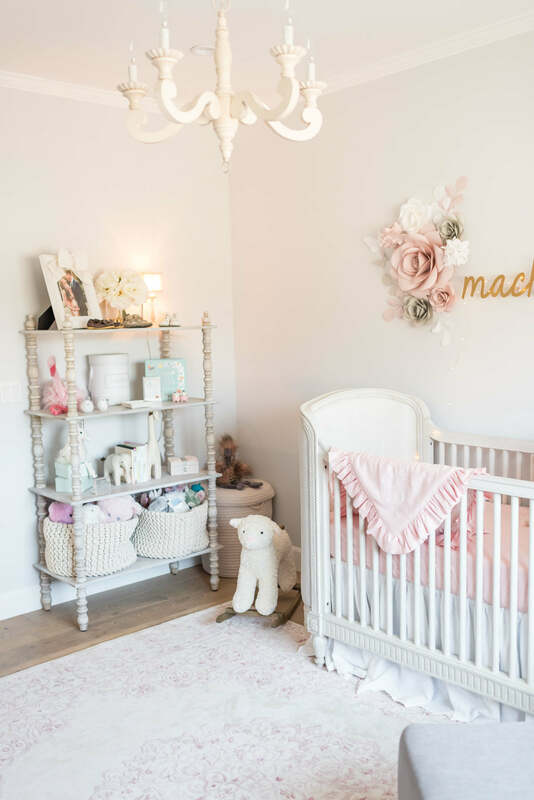 Her nursery is so adorable & cozy! I love it! You should see the big grin on my face, seeing my gift displayed. I am so happy that you received it and have included it in your her room. I plan on rereading the entire series this year. 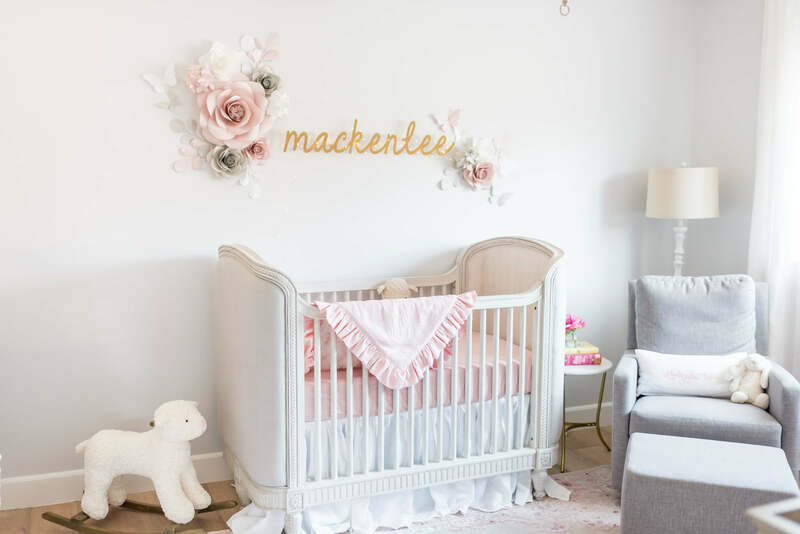 This nursery turned out so beautiful, great job! The nursery turned out beautiful! Congratulations! Is there any chance that your sister-in-law that created the beautiful “Daughter of the King” artwork has a shop? I really loved that print! 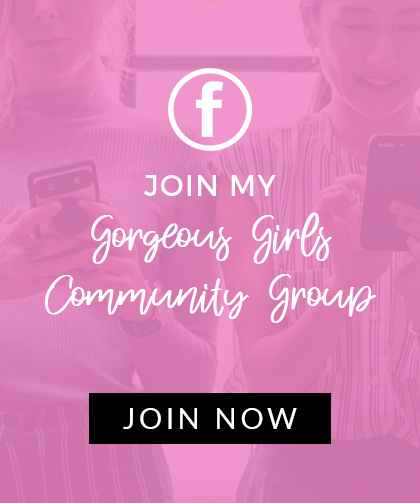 Your baby girls nursery is gorgeous! What color is that on the walls? 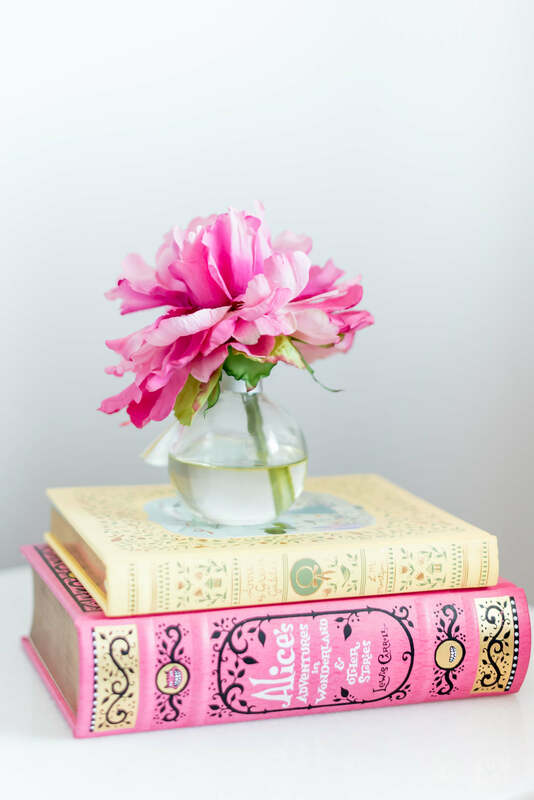 So pretty, simple and girly!! Love the idea for her shoes!! I’ve been struggling with finding something to do with our little ones shoes except throwing them in a basket from Target!! Thank you, Ashley! I saw that idea on Pinterest and had to have a gold bar and clips lol! 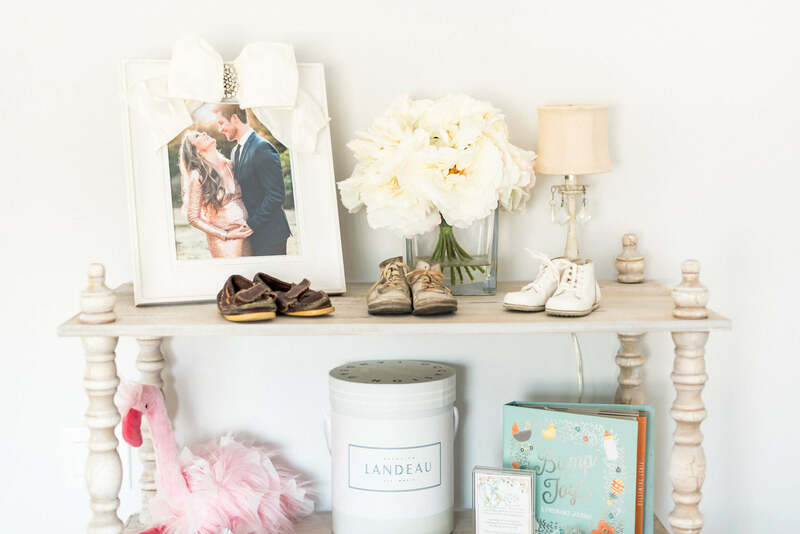 This nursery is major GOALS! But I do have one question about the rug. In the description it says 8 by 10 but the biggest size listed is 7’6″ X 9’6? That’s the right size, I just rounded up to 8×10 because it was easier to type that out, lol!